Delhi-based Fairassets Technologies India Pvt Ltd, which operates peer-to-peer lending platform Faircent, has raised Rs 25 crore ($4 million) in a Series B round of funding led by new investor Incofin Investment Management, a Belgium-based impact investor, the company said in a statement. Other new investors who participated in this round include non-banking finance company Muthoot Fincorp, New York-based early-stage investment fund Elevate Innovation Partners, Japanese investment fund Das Capital, and Singapore-based early-stage investor Starharbor Asia Pte Ltd. Besides, existing investors JM Financial Services, 3one4 Capital, M&S Partners Pte Ltd, and Aarin Capital also participated in the round. The five-year-old company will use the funds to enhance its financial product offerings, strengthen its technology platform, and to market and promote P2P lending, the press note added. With this round, the total funding raised by Faircent till date is pegged at a little over $6.08 million. The company had earlier raised a total of about $2.08 million from BCCL, Aarin Capital, 3one4 Capital, JM Financial Products Ltd and M&S Partners, according to data available with VCCEdge, the research platform of News Corp VCCircle. 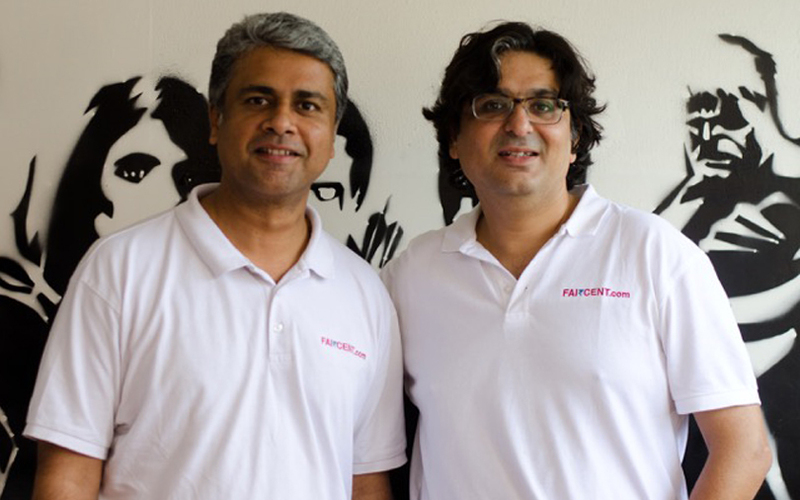 Founded in 2013 by Rajat Gandhi, Vinay Mathews and Nitin Gupta, the Faircent marketplace connects curated and verified borrowers and lenders. Interested individuals can register themselves on the platform, following which Faircent undertakes a verification process that includes authenticating KYC norms stipulated by regulators besides assessing the creditworthiness of the user. The company uses a proprietary automated feature that matches a lender’s investment criteria with the borrower’s requirements and automatically sends proposals to the borrower on behalf of the lender, based on pre-selected lending criteria such as loan tenure, amount, and risk profile. Consequently, lenders and borrowers interact amongst themselves to decide on a mutually agreeable rate for their loans. Once an agreement is reached, the loan amount is transferred to an escrow account which the company has opened with IDBI Bank. On completion of the transaction, the money is transferred into borrower’s account, who can then make periodic repayments through equated monthly instalments over the stipulated time period. Currently available only to Indian residents, the platform offers both personal and business loans on its platform. “These are exciting times for P2P lending in India and the fact that the RBI has come out with progressive guidelines for the sector is a great validation of this business model. Moreover, with P2P lending, the financial market is all set to witness the creation of a totally new asset class,” Rajat Gandhi, founder and chief executive of Faircent stated. Gandhi has over 13 years of experience in the Internet space. In one of his prior stints, he worked for 14 years at the Times Group, where he served as the marketing head for Times Business Solutions, which is the holding company for Timesjobs.com, Simplymarry.com, Magicbricks.com, and Ad2book.com. Prior to setting up Faircent, Mathews was the national head of sales at Timesjobs.com. Gupta has previously worked at senior positions at MasterCard, GE Capital and Rediff.com and was a non-executive co-founder of LetsBuy, an electronics e-tailer that was acquired by Flipkart in 2012. He is also the founder chairman of Dynamis Digital, a digital media solutions firm. He is also on the board of several firms such as Loylty Rewardz and DHFL Pramerica Life Insurance. The alternative lending space has seen considerable investor interest. Online lending platforms Flexiloans, Capitaworld, Paisabazaar and Cash Suvidha raised funds this month. Last month, NBFC Prest Loans and online loans platform for two-wheelers CreditMate secured funds.